Pellelucent Age-Management Cream protects, nourishes and re-vitalises the appearance of your skin. Our classic 30ml Age-Management Cream is a luxurious, long-lasting product based around core active ingredients which strengthen and smooth the skin. Pellelucent 30ml Age-Management Lotion is the lighter alternative to Pellelucent Cream products while still offering the same strength of active ingredients as our luxurious cream products. Pellelucent Age-Management Cream 100ml is ideal for those already familiar with Pellelucent products. It offers exceptional value and gives you the opportunity to enjoy the substantial long-term benefits that come with continued use. 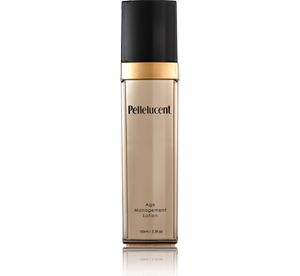 Pellelucent Age-Mangement Lotion 100ml is the ideal product for women who are looking for a serious anti-ageing product in a light, easy to apply formulation.